Wherever you're heading: the comfortable, continuous Enviolo hub gear and the Gates belt drive ensure pure riding pleasure everywhere. The Bosch Performance Speed motor provides assistance up to 45 km/h (28 mph). 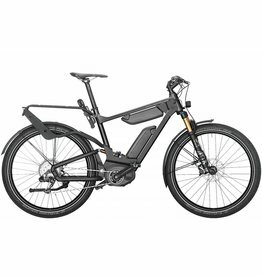 The Control Technology with full suspension, the hydraulic Magura MT4 disc brakes and the extremely bright 1,250-lumen Supernova M99 Mini front light ensure maximum safety. Schwalbe Super Moto-X Fat Tires prevent any sinking on soft terrain.